Traders can easily get lost among all the technical indicators available for analysis. That’s why we want to show you not only the most popular indicators, but also shed light on the less known indicators which can make a difference to your trading analysis. In this article, two less known trading indicators are presented that every trader should know about – The Commodity Channel Index (CCI) and the Momentum Indicator. The Commodity Channel Index (CCI), developed by Donald Lambert in the eighties, is an oscillating indicator which measures the deviation of the security’s price against its moving average (MA) and the normal deviation of the moving average. Despite the name, the CCI indicator can successfully be used with various security types like stocks, currencies and indices. As it measures the current price relative to the moving average of the price, CCI increases in value when the price is far above the its average, and decreases in value when the price is far below its average. That’s why CCI can also be used for identifying overbought and oversold conditions. The chart above shows the CCI indicator plotted below the GBP/USD daily chart. It uses a 20-day period which a common period used with the CCI. This means that each new calculation is based on the 20 most recent days for calculating the average price of the pair. Other common periods used in conjunction with CCI are 30 and 40, which generate a less volatile indicator to price changes. The longer the periods, the less often the value of CCI will move outside -100 and +100. Notice how the CCI remains for most of the time inside the -100 and +100 range in the chart. Lambert used a constant of 0.015 in the CCI calculation to ensure the indicator falls between this range 75% of the time. Values higher than +100 and lower than -100 are showing extreme strength or weakness in the market. The snap election announcement in the UK moved the CCI to 395, a multi-month high of the indicator for the GBP/USD chart. The most common CCI strategy is to enter long positions when the CCI moves above +100, indicating a strong move up in the price, and to enter short positions when the indicator moves below -100. 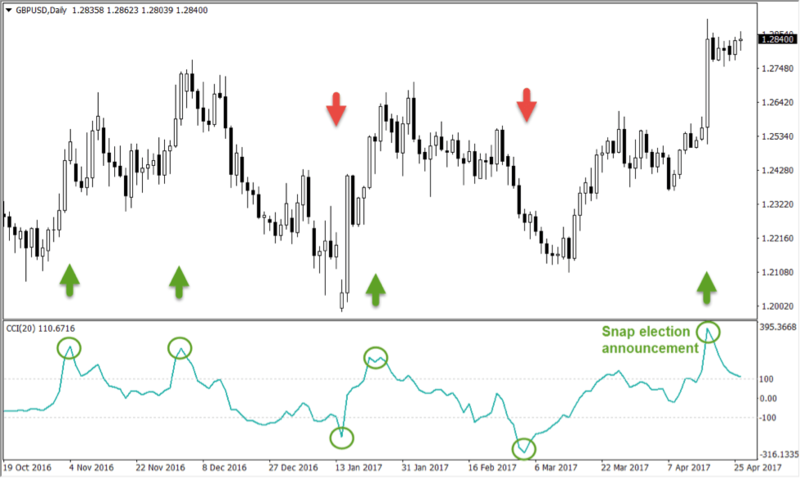 The Momentum indicator is a simple technical indicator of the oscillator family, which compares the most recent closing price to a single previous closing price. It shows where the present trading price is in relation to a price in previous sessions. The previous closing price is determined by the indicator’s setting, for example a 10-period Momentum indicator compares the present closing price with the closing price 10 periods ago. Hence, if the closing price of the most recent period is higher than n-periods ago, the value of the indicator will be positive. If the most recent closing price is lower, the Momentum indicator will be negative. There are two versions of the indicator: the first one shows the difference of closing prices in absolute terms, and the second shows the difference in percentage terms. 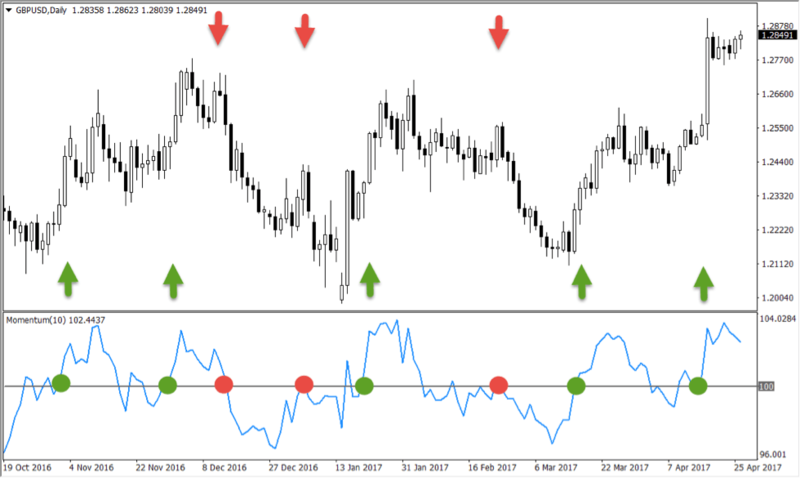 The chart above shows the Momentum indicator on the same GBPUSD pair used for previous examples, so traders can compare the difference in indicator values. The used setting is a 10-period indicator, which in this case means the recent closing price is compared to the closing price 10 days ago. If the recent closing price is higher than the one compared, the Momentum indicator will move above the zero line (which is plotted at the value of 100). If the recent closing price is lower than the closing price 10 days ago, the indicator will move below 100. The greater the compared difference between the closing prices, the greater the distance will be from the zeroline. A simple trading strategy based on the Momentum indicator is the zeroline crossover. A cross above the 100-line is considered a buy signal, and a cross below the 100-line is considered a sell signal. Usually, much of the price move will already happen when the indicator crosses the zeroline. False signals also appear often with the Momentum indicator. To prevent these drawbacks, it is possible to add a moving average of the indicator and to buy when the indicator crosses the MA from below, and sell when it crosses from above.